Brand New Vulcanized Rear Windshield Weatherstripping. High Quality OEM Style Replacements. 18-1/2" X 53" X 61. Fits the following 2 Door and 4 Door Sedans. 1964 - 1965 Plymouth Belvedere. 1964 Plymouth Fury - Savoy. 1964 Dodge 330 - 440 - Polara. 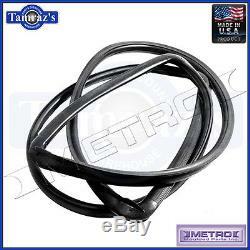 The item "64-5 Mopar B Body Vulcanized Rear Windshield Weatherstrip Seal VWS2710R USA MADE" is in sale since Monday, September 8, 2014. This item is in the category "eBay Motors\Parts & Accessories\Car & Truck Parts\Glass\Auto Seals".